Small towns sometimes suffer water shortage in summer. Trucks have to regularly refill water tanks, which are installed under houses or gardens. 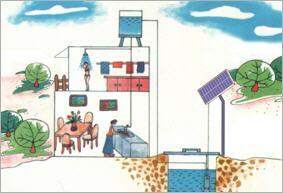 Another option is to build underground cisterns to collect rainwater. The house owner needs to pump the water from the cistern to the upper floors with a small pump station, which runs with 230V AC, or even have to carry it up by himself when there is a lack of electricity. The LIUJIA Solar pumps are an ideal solution for this as they deliver the water reliably to the top and save physical labor. Another application possibility is that the pumps can be used to circulate water in the cisterns, with the intention to increase oxygen level in the water, thus avoiding any water contamination.